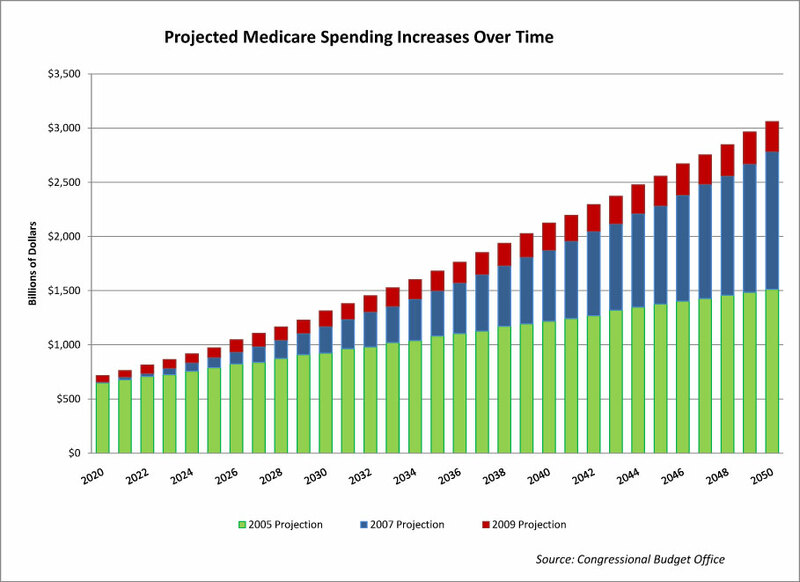 Is it true that Medicare is facing a crisis, and that it is one of the “drivers of our debt”? How do the Republican presidential candidates, and Ryan himself, plan to address this so-called debt crisis? First, on Medicare’s finances, according to the 2015 report from Medicare’s trustees, the fund can pay full benefits until 2030. At that point, the trust fund is projected for exhaustion, but that should not be confused with going bankrupt. Even then, the program will still be able to pay for 86 percent of costs, and modest tweaks to the program or additional healthcare cost savings over and above those in Obamacare – the ACA has helped to reduce Medicare’s projected 75-year funding gap from 3.88 percent of payroll taxes to .68 percent – could eliminate the projected shortfall in the trust fund. Trustee reports have been telling us the Medicare trust fund will soon be insolvent for decades, but presidents and Congress have always taken steps to ensure this didn’t happen. What we need is a functional Congress with honest leaders rather than scare tactics designed to support an ideological goal of lower taxes for the wealthy and severe cutbacks in social insurance programs. Second, Republicans are worried about a “debt crisis.” Seriously? Paul Ryan’s budget proposals are nothing more than disguised upward redistribution of income sold as addressing the budget deficit. The proposals – like those of Republicans more generally – involve massive cuts to social programs ordinary Americans rely upon combined with huge tax cuts for the wealthy that blow huge holes in projected budget deficits. Donald Trump’s tax plan will result in a fall in revenue of 9.5 trillion dollars over the next ten years, yet somehow he will fulfill his promise to protect Social Security and Medicare and balance the budget? When push comes to shove (or worse – this is Trump after all), who do you think he will protect, social insurance programs the working class relies upon for economic security or his own and his party’s wealthy interests? Ted Cruz has proposed an 8.6 trillion dollar tax cut. How, exactly, will that be financed without large cuts to social insurance programs or huge increases in the budget deficit? In addition, the notion that a large proportion of working class tax dollars goes to support the “undeserving poor” has been pushed by Republicans for decades, but this is yet another deception designed to support the ideological agenda of the wealthy interests that have been in control of the Republican Party. The reality is that most of this spending – around 98 percent according to an analysis by the Center for Budget and Policy Priorities – goes to working households and people with clear, demonstrable needs. I am very happy that the Republican con is starting to come to light. Members of the working class who support Trump are beginning to see that the elites in the Republican Party do not have their best interests at heart. I am not pleased at all, however, that people are still being led to believe that there are simple answers to budget problems that do not require raising taxes, or, alternatively, reducing their hard-earned benefits from programs such as Social Security or Medicare. When working class Republican voters are asked if they support reducing the budget, they generally echo what they have been told by the elites and say yes – of course that’s a good idea. But when they are asked if they favor cuts to programs they benefit from, Social Security for example, the answer is a resounding no. What the Republican elites fear most of all is that the working class voters who have supported them in the past will come to realize that the solution is not the false promise of prosperity for all from tax cuts for wealthy “job creators,” or cuts to the programs the working class depends upon, but rather tax increases on those who have done so well within our economic system. The Republican elites are right to be afraid.